The Composites Innovation Centre celebrated it’s 10 year anniversary on October 23 this year. Please enjoy this reflective and commemorative video on CIC’s last ten years. Dynamic Attractions, based out of Victoria, BC, and a subsidiary of Empire Industries Ltd of Winnipeg, MB, designs and builds innovative amusement park rides. Recently, CIC partnered with Dynamic Attractions to design and build the composite seating bench for their immersive tram ride. 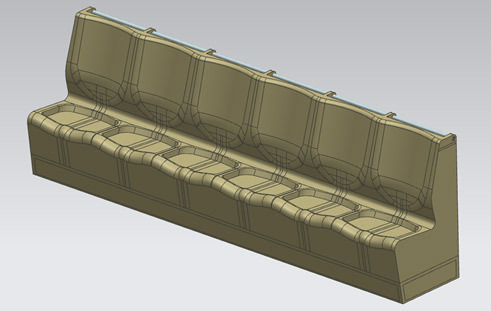 CIC analysed the composite/metallic assembly under a variety of loading scenarios using Siemens NX software. 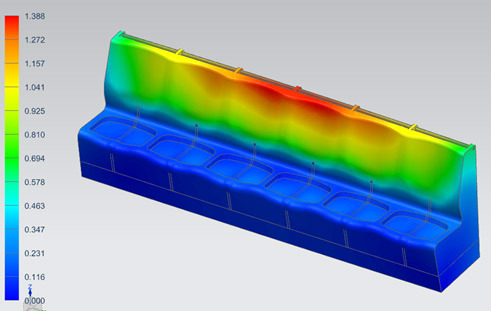 Vibration and horizontal, vertical, and lateral G force load cases were examined. Reviewing the results enabled CIC to optimize the ply layup of the bench to minimize weight while meeting the required safety factors. CIC also worked closely with the manufacturer of the benches, Twin Anchors of Sicamous, BC. The communication between the partners ensured that ease of manufacturing was considered throughout the design process. The collaborative effort between Dynamic Attractions, Twin Anchors, and CIC resulted in a bench that was optimized for weight and cost, while ensuring the safety of the occupants of this thrilling ride.